1875 Imray Blueback Nautical Chart or Map of the Carnary Islands. WE SELL ONLY ORIGINAL ANTIQUE MAPS - NOT REPRODUCTIONS JOIN OUR WEEKLY MAILING LIST FOR NEWEST STOCK. Title: Chart of the Canary Islands, Drawn from the Surveys of Capt. Arlett of the Royal Navy. Description: An elegant 1875 James Imray nautical chart or map of the Canary Islands. This map was originally published by Imray in 1860, the present example being a later edition, based upon the important surveys of Captain Alexander Thomas Emeric Vidal of the Royal Navy. Centered on Gran Canaria, the map extends to cover all of the islands as well as parts of the adjacent west African coast. Insets details Santa Cruz (Tenerife), Puerto da la Luz (Las Palmas, Gran Canaria), Arreciffe (Arrecife, Lanzarote), the Strait of Rio, and Bocayna Strait. Profiles detail Tenerife, Grand Canaria, and Santa Cruz. Vidal and Arlett completed a series of surveys of the African Coast, Madeira, and Canary Islands in from 1838, but specifically around the Canary Islands in 1844. Before Vidal this area was poorly mapped and a haven for slavers and pirates. Vidal's achievement in surveying the region was praised by the Secretary of the Royal Geographical Society This tedious undertaking is drawing to a close, and will then be of equal utility to the fair traders and the anti-slavery cruisers. It is fortunately in the hands of such a man as Captain Vidal, R. Who has steadily devoted himself during a long period of ill-health, to complete this unpopular work, and to connect with it a minute examination of the Canary Islands. This map appears surprisingly rare. We have identified advertisements for it in Imray's catalog, but no other examples either in institutional or private collections. Nor are there available sales records for this map in the last 30 years. This map is owned jointly by Geographicus and Vetus Carta Maps. Size: Printed area measures 26 inches high by 40 inches wide. If your address is a P. DHL International EXPRESS (45 USD). We can use your Federal Express Account. Duty varies by country and we cannot predict the amount you will be charged. Some countries are duty free, others are not. Additional Services Conservation Framing Services: Geographicus recommends basic conservation framing services for any antique paper. We do not offer this service. Antique Map Restoration Services: Geographicus can repair and restore your antique map. Services include deacidification cleaning flattening and backing. 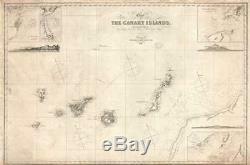 The item "1875 Imray Blueback Nautical Chart or Map of the Carnary Islands" is in sale since Saturday, May 19, 2018. This item is in the category "Antiques\Maps, Atlases & Globes\Africa Maps". The seller is "geographicusmaps" and is located in 11221. This item can be shipped worldwide.